The i-Socket Autoswitch is the only intelligent switch that can control the in-rush of current on start up to eliminate circuit overload with a 7 second delay off. 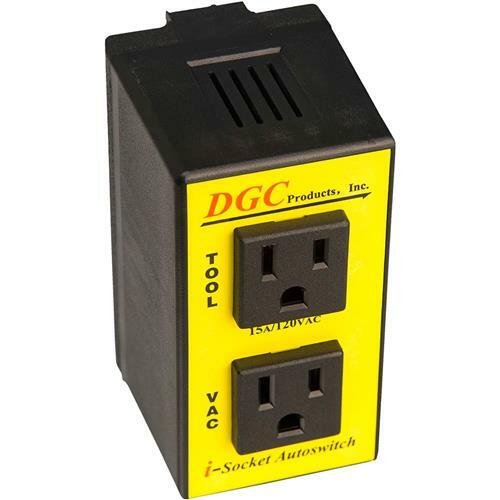 Simply connect a vacuum hose to the dust collection port of the tool and plug the i-Socket Autoswitch into any standard 15A/120V house outlet. Tool plugs into the "TOOL" outlet and vacuum plugs into the "VAC" outlet. The vacuum switch must be in the ON position for auto-start up and then you are set to save electricity costs and extend the life of your vacuum system. 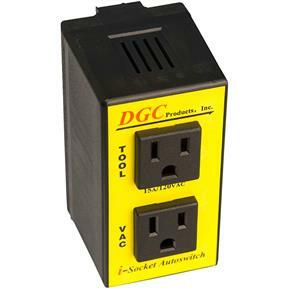 Please note The i-Socket Autoswitch is designed for medium duty work loads in the home workshop and on the job site. Bought this to put on our miter saw station so we could add dust collection to it. It is an amazing product!! This switch works just the way it should. I am very well satisfied with it. Unfortunately I have not setup my woodworking shop yet we just moved in our new home so it might be a few more months until I get to try this product.